Holi is an ancient festival of Hindu religion and celebrated for generations. Typically, all Indian festivals follow the Hindu calendar which derived from the moon cycle and the solar cycle. Hence every year Holi falls on a different date. Holi festival indicates the beginning of the spring festival. In India, each region has different rituals and the festival celebrated by following those rituals. Holi signifies the victory of good over evil. This year’s celebration was totally different, we have celebrated Holi on the beach. This is not a sponsored post. All opinions are mine and not influenced by anyone. I moved to California last year, so pretty new to the area. This is my first Holi in the area so I didn’t have much idea. 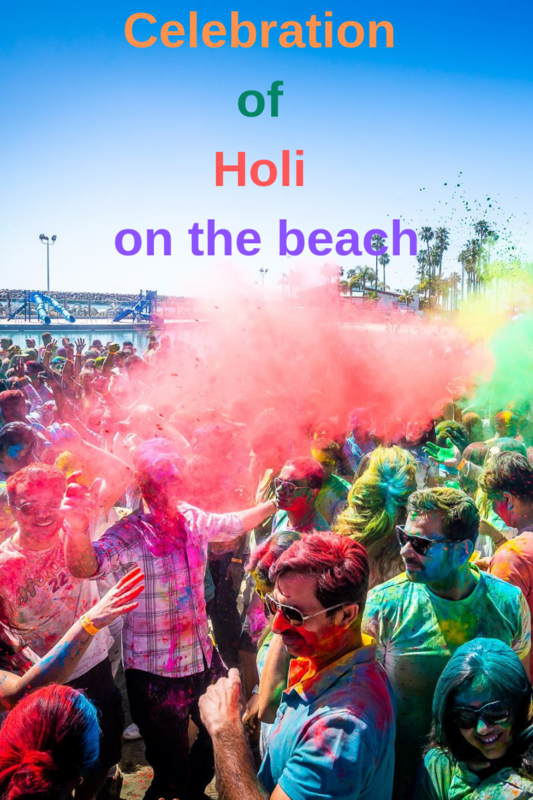 My partner’s colleagues planned to attend the Holi on the beach event. I had no idea this celebration is so huge. 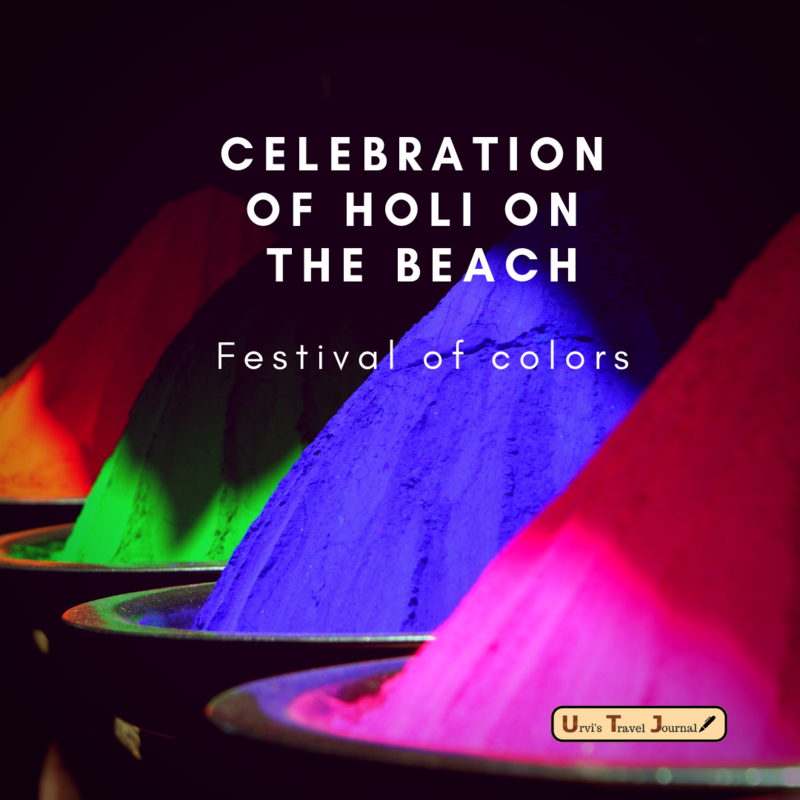 What is Holi on the beach? 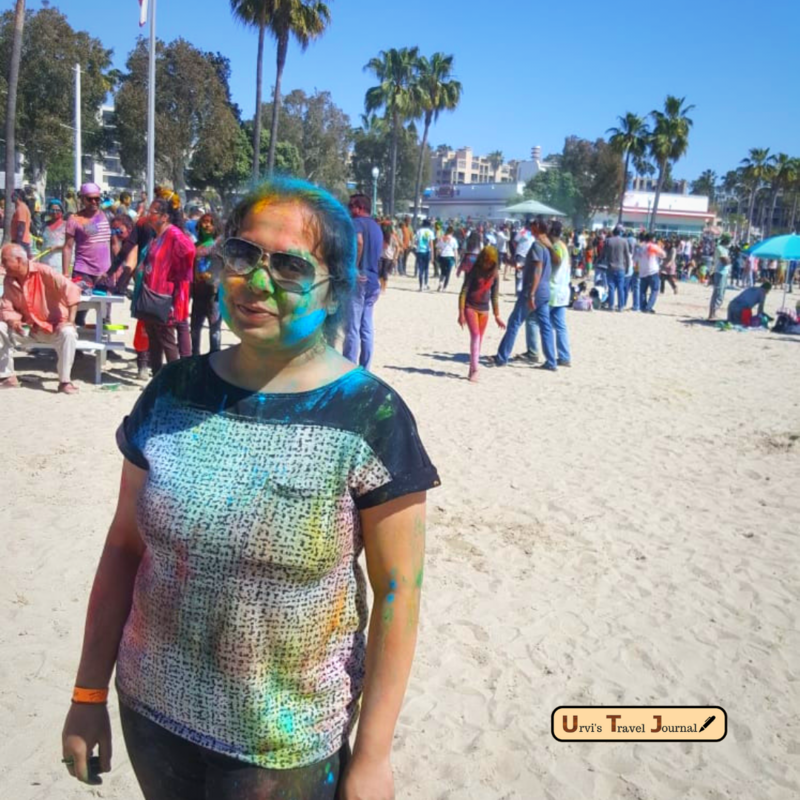 The Association for India’s Development (AID) LA-OC organizes Holi on the beach event every year. This is just like a fundraiser event. All the money raised from this event will be used to strength underprivileged communities in India. The event was on the seaside lagoon at Redondo Beach. The place got pretty crowded, thank god we reach there by 12ish so we had plenty of time to enjoy. The ticket includes one free packet of color. You can pick whichever color you like. You can buy extra packets of color from there. The moment you enter the premises you can feel the color in the air. The spirit in crowed makes you feel more energetic. And none of the celebrations completes without music. I know we all have smartphones and we capture every moment to make lovely memories. We make sure not to miss the photo booth. It is something fun to add in your memory book, isn’t it? They have lovely props and an automated photo booth, which gives an instant print of pictures. Besides all this fun, don’t forget you need food after losing all the energy on the dance floor. There were plenty of food options to buy and free tea to make you feel refreshing. We really enjoyed the California style Holi celebration. I never imagined I would celebrate Holi on the beach. It was a fun event and looking forward to next year’s Holi event.